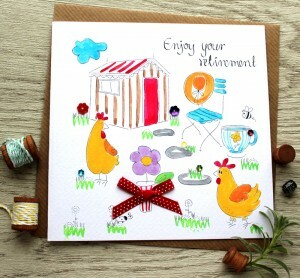 Spring Fair is just around the corner and we will be launching 60 new designs at the weekend. It is the biggest trade show in the UK and hosts 300000 products from 3000 exhibitors and 64000 visitors attend it every Spring. It is where the planning for the year ahead happens. We will be showcasing never seen before designs from three different ranges. 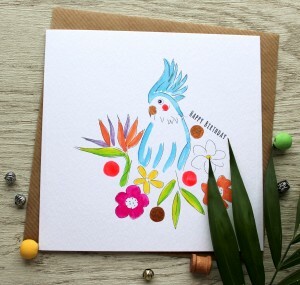 First one is our new range Cockatoo, which we have been delighted to have been featured in Progressive Greetings. page 119. We are tapping on the tropical trend and it features parrots, flamingos, cocktails and tropical flowers and has true summer feel. The first 20 designs are across everyday and popular occasion captions. All designs are hand-illustrated and hand-finished with cup flower jewels and polka dot bows. 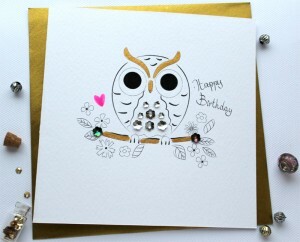 We proudly design and hand-finish our cards here in England. The cards are 145 mm square and wrapped in rib craft envelopes and cello bags. Then, we have our glamorous and chic range Bijoux. The monochrome line work features hand-illustrated elegant designs of fashion shoes, posh teacups, champagne flutes. The artwork is accentuated with gold paint and hand-finished with colourful cup flower jewels and organza bows. The 20 designs are across everyday and popular occasion captions. 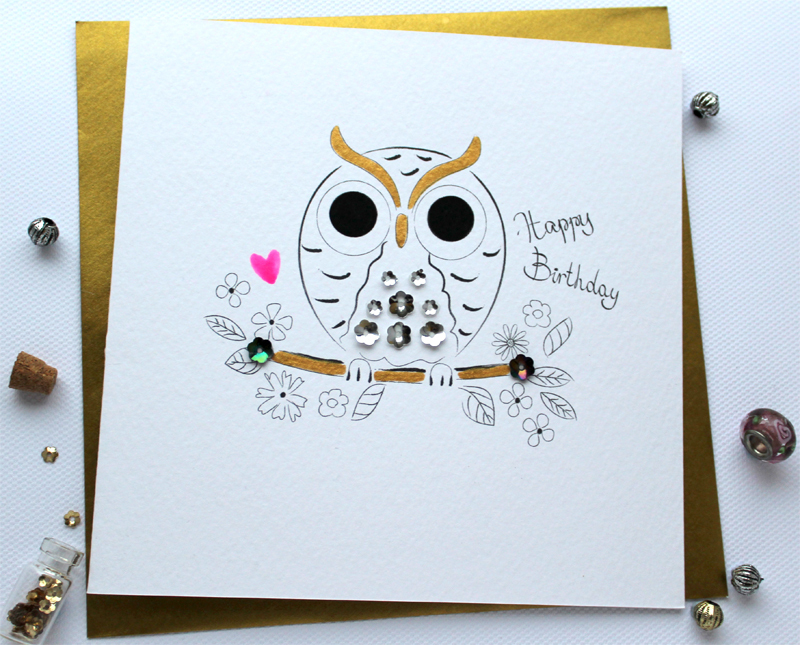 All cards are competitively priced to delight your customers. The cards are 145 mm square and individually wrapped in gold envelopes and cello bags. 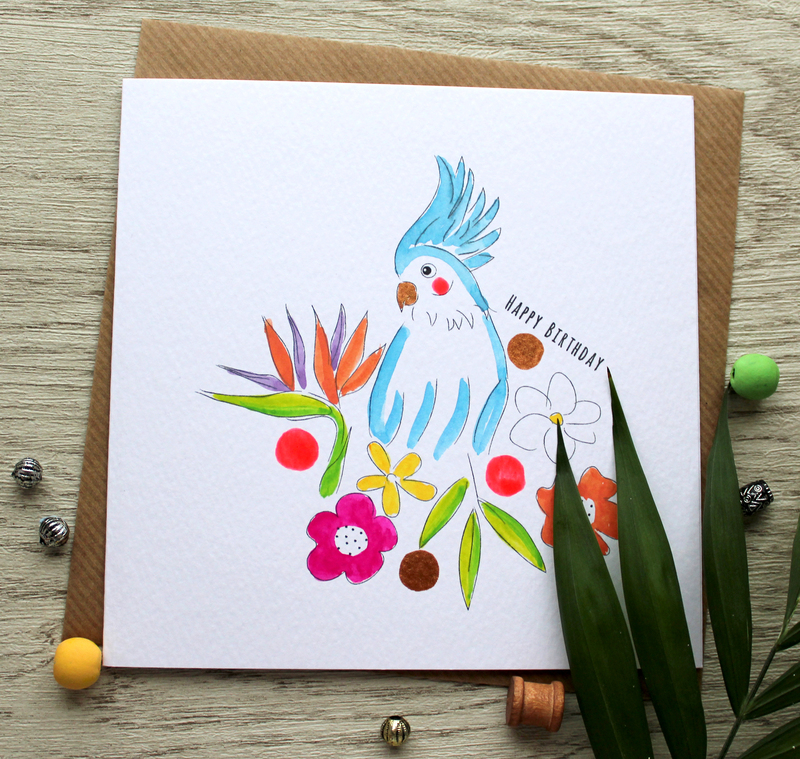 And at last, we have expanded our popular Garden range with 20 new everyday and occasion captions, featuring chicken, sheep, birds and abundance of colourful garden blooms. All designs are hand-illustrated and hand-finished with cup flower jewels and polka dot bows. The cards are 145 mm square, wrapped in rib craft envelopes and cello bags. We have undergone the mighty task to totally revamp our product shots and the catalogue. As such, more that 250+ designs have been re-shot and re-touched and we are really pleased with the result. You can download the ranges when you click here and if you require trade prices or paper catalogues and a sample, please get in touch. We would also like to invite you to visit us at Spring Fair so you can see the cards in the flesh and there would be all best-sellers too. So, if you are at the show come and see us on stand 3W18. If anything, we will have chocolate to top up your sugar levels and keep you going those long miles at the NEC. We look forward meeting you and doing business with you.